I’m back with a fun program to start the new year: Sing Along with Karl, Jack and Dan, who were also known as The Landt Trio. This website gives the history of the group along with a catalog of known recordings. There aren’t many. 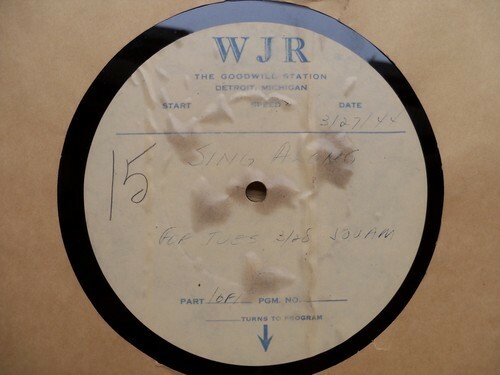 This program is dated March 27, 1944 for broadcast on WJR on March 28 at 1:00am. Songs include “I Want to be Happy,” “So Little Time,” “Someone Else is Taking my place,” “When the Red Red Robin goes Bob-bob-bobbin’ along” and “Ikki Tikki Tambo” (or something close to that, it’s a little hard to catch exactly what they’re saying). The whole program is a lot of fun; my kids enjoyed listening as I recorded and edited it. Here’s the direct link to the download page at my bandcamp site.